DINGOLFING, Germany - Recently, Mercedes-Benz revealed its latest innovations that will debut in the 2016 Mercedes E-Class. The next generation ‘E’ will be premiere at the IAA Auto Show in Frankfurt in mid September. From then on the E-Class can be considered the benchmark with respect to safety systems. So far, this role has been reserved for the S-Class. Usually, the new technologies are then rolled out in the other models. But the new E-Class will arrive on the market with new and enhanced systems and will take over the function of role model from the Mercedes flagship. We are aware that today, cars can already observe their environment, but they can not yet look around the corner. That is, until the arrival of the new E-Class, which will be the very first production model being able to do so. It is a result of Daimler’s ongoing developments to prepare cars for autonomous and accident-free driving. 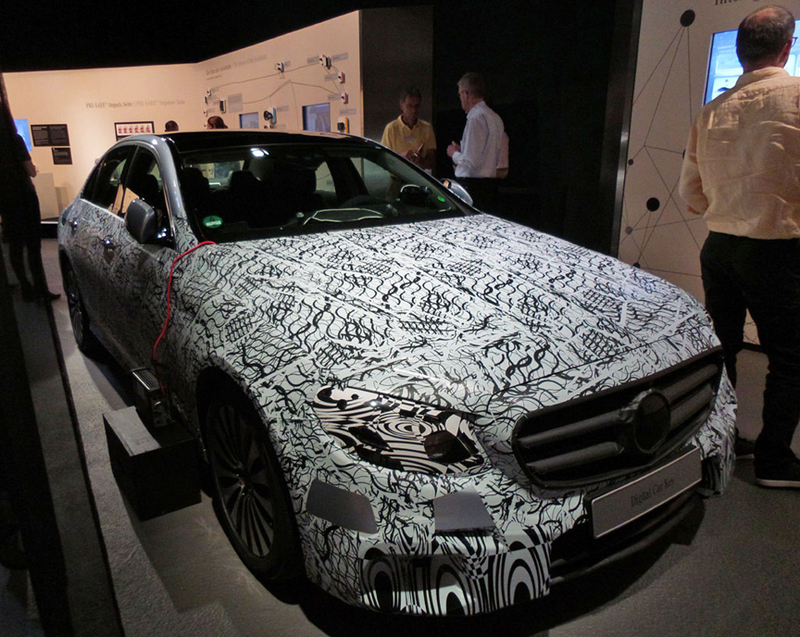 Two years ago, Mercedes introduced car-to-car technology based on sensors, radar and camera systems. This has been further developed, resulting in Car-to-X communication. The hardware will be implemented in the new E-Class, making it the very first production model that is able to ‘look around the corner’. 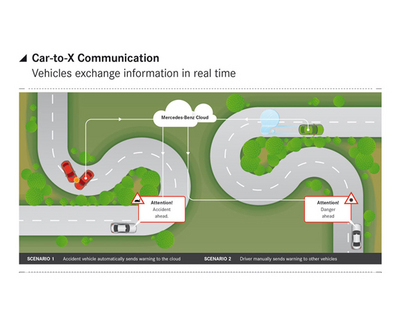 With Car-to-X communication the dangers on the road ahead can be recognized and drivers can be warned accordingly. C2X can detect dangerous situations, such as obstacles on the road, suddenly occurring bad or slippery road conditions. Such situations can be transmitted by the car or the driver to a back office, in this case the Daimler Vehicle Backend. In only 2 seconds the information will be transmitted to other new E-models in the immediate area. In future, all Mercedes vehicles would thus be able to communicate with one another and with the infrastructure. As some other car manufacturers are also in the process of developing C2X communication, eventually communication between cars and infrastructure will be possible, independent of the brand. For the new generation ‘E’ the system has been designed in such a way that information can be received from rescue services, police, firefighters and ambulances. Even though there are apps currently available to warn drivers that such vehicles are approaching by means of an acoustic and/or visual signal, the use of a smart phone is still a prerequisite. This also applies to the Bosch-developed app that warns of wrong-way drivers. Soon, such warnings will also be automatically transmitted to the E-Class, because Mercedes says that preparations are under way for integrating further sources of data. At the presentation of innovations, Christoph von Hugo, responsible for the development of Active Safety Systems, said: "Our system is cheap, because the COM-module with its own SIM card is installed in the existing unit, and therefore, a smart phone is not required. It would be ideal to use DSRC, Direct Short Range Communication, but this is expensive and that means that the market penetration is very slow. Our system is easy to integrate into new models." With the market introduction in early 2016, the "E" will be almost a year ahead of the new BMW 5-Series, that is expected in 2017. But first, the Bavarian car manufacturer will unveil its new 7 Series at the IAA with innovations that may be implemented also in the upcoming ‘5’. Please stay tuned for more information about the upgraded safety technology in the 2016 Mercedes-Benz E-Class.